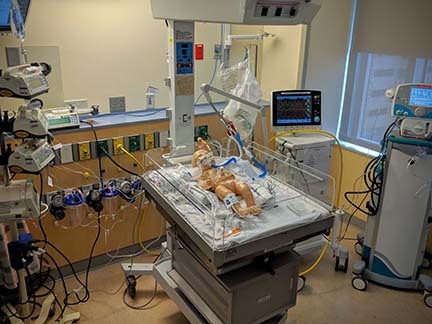 Les Barta, Director of our Simulation Technology Program recently worked with School of Pharmacy students, other RBHS students, and practicing health care professionals in a simulation exercise at the Bristol Meyers Squibb Children’s Hospital in the Neonatal Intensive Care Unit. They tested the process for putting a patient on a heart-lung bypass machine (an extracorporeal membrane oxygenation – ECMO). Their goal was to improve technical skills and time on task. The ECMO machine provides critically ill patients with a means to allow their own systems to rest temporarily, while the machine takes over basic life functions. Fundamentally, this is a very complex team-based therapy that requires excellent collaborative skills. Pharmacists play an important role in this life-saving procedure. Click here to see pictures of our students participating in the exercise.